The Cermetek CH4390 900 MHz modular radio retrieves wireless sensor data. Patented SensorOnAir technology permits the CH4390 to remotely retrieve data from individual sensors and manipulate control lines. The CH4390 provides access to 5 dedicated analog inputs and 12 programmable I/O pins. The CH4390 incorporates a proprietary mesh networking protocol. This protocol was developed in corporation with Sandia Laboratories and supports point-to-point, star and tree networks. Any CH4390 can be configured as a Network Coordinator, Router or Endpoint. Configuration is accomplished through simple Text commands entered into the serial port. The CH4390 includes FCC Part 15 modular certification. No license is required for customers who design this module into their systems. · SensorOnAir allows sensors to be connected to Endpoint or Router nodes to be read remotely from the Network Coordinator. The following design notes are intended to assist the developer in achieving maximum utility from the CH4390. A typical connection diagram is included on page 10. Power Supply: The CH4390 module utilizes sensitive high frequency electronics. The CH4390 divides the 900 MHz Frequency band (902 to 928 MHz) into 64 distinct channels to spread the power over the entire frequency band. This frequency hopping scheme allows higher transmitted power than would be possible with a single carrier frequency. Even with this higher signal power received signal strength can still be very low making demodulation difficult. 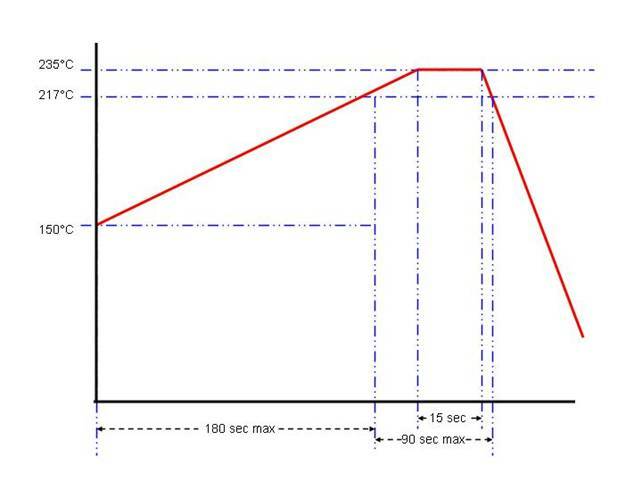 Steps must be taken by the user to guarantee that power supply noise on all supply lines, including ground, does not exceed 50 mV peak to peak. Dedicated power and ground planes are essential for good results. Failure to provide such operating conditions could cause the CH4390 to malfunction or to function erratically. The CH4390 requires a single +3.3V ± 0.3 volt supply. It is recommended that by-pass capacitors be placed on the power supply as close to the modem’s supply input as practical. Cermetek recommends a 10 mF Tantalum capacitor in parallel with a 0.01 µF ceramic capacitor. Non-Volatile RAM (NVRAM): The CH4390 incorporates NVRAM to store the configuration profile. The AT&W command will store the active settings of The Bx, Kx, Mx, Nx, Px, Ux, and AT&D commands. FCC Part 15 Certification: The CH4390 includes FCC Part 15 modular approval. The FCC ID Number is B46CH4390. This permits operation in the United States with no license. Sensor Inputs/Control Outputs: The CH4390 employs five dedicated Analog Inputs and 12 programmable Digital Inputs/Outputs. 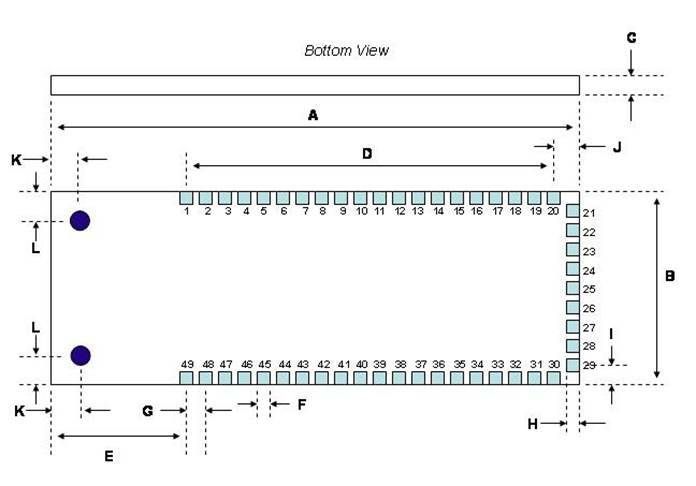 The Analog Inputs, ADO, AD1, AD2, AD3, and AD4, have 12 bit resolution. These inputs are referenced to the Vref input to the CH4390. The Digital Input/Output lines are defined as inputs or outputs by the user with the AT&D command. These input and output lines can be used when the CH4390 is configured as an Endpoint or a Router. SensorOnAir: This patented technique allows the reading of remote sensor values or setting remote outputs with a single command. No micro-controller or other intelligence or intervention is required at the sensor node. The command AT#PmUnR is used to read the remote sensor values at the Endpoint or Router defined by PCN “m” (Parent Channel Number) and Unit ID “n.” When this command is issued the Endpoint returns the values of all of the sensors as a string of hexadecimal codes, see below. The “.R” prefix indicates that the sensor readings follow. The command AT#PmUnSxxxx is used to set the signal levels at the Endpoint defined by PCN “m” (Parent Channel Number) and Unit ID “n” which have been defined as outputs. The variable xxxx is the decimal sum of the output settings per the chart below. An output will remain low until set high. Control and configuration of the CH4390 is accomplished through commands issued through the module’s serial interface. Below is a list of the available commands. A/ - Repeat Last Command: The A/ command causes the CH4390 to re-execute the last command it received. Bx – Serial Port Baud Rate: The “B” command sets the data rate at which the serial interface will accept commands and send responses. The default value is 19,200 bps, x=4. Mx – Node Type: This command defines the module’s network function. Nx – Set Network ID: This command sets the RF module’s Network ID. The Network ID of two modules must be the same for them to communicate. Ux – Set Unit ID: this command sets the node address of the module. Each node in a network must have a unique Unit ID. Px – Set Parent Channel Number: This command sets the Parent Channel Number ( PCN) of the node. The PCN of the Router or Network Coordinator must be the same as the Child the Channel Number ( CCN) of the lower level Router or Endpoint nodes with which it communicates. Other sub-networks may not use the same PCN. Kx – Set Child Channel Number: This command sets the Child Channel Number ( CCN) of the node. The CCN of the Router or Endpoint must be the same as the Parent Channel Number ( PCN) of the higher level Router or Network Coordinator nodes with which it communicates. Other sub-networks may not use the same CCN. AT&Dnnnn – Program Digital I/O: This command defines the 12 Digital I/O as either inputs or outputs. The “nnnn” represents the decimal sum of a 12-bit binary sequence, see below. Setting a bit to 1 defines the I/O as an output. In its default state The CH4390 has P3.0 to P3.7 set as outputs and P1.0 to P1.3 set as inputs, decimal sum 255. 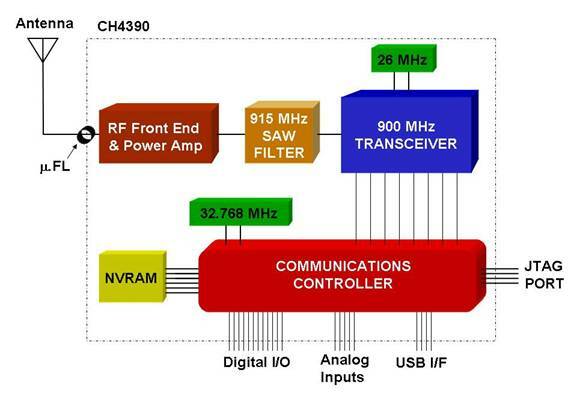 AT&I – Read Local I/O Value: This command causes the CH4390 to report the current value of all of the Digital I/O lines. The values will be reported as the sum of the decimal values as described below. AT&On – Set Local I/O Value: This command sets the condition of the Digital I/O lines defined as outputs. The values are issued as a single decimal number as shown below. AT&V – Display Current Settings: This command causes the CH4390 to respond with a listing of its current configuration. AT&W – Save Current Settings: The &W command causes the CH4390 to save the current configuration in NVRAM. AT#Bn – Broadcast: The #B command causes the CH4390 to broadcast its wireless carrier on frequency “n.” Transmitting on a single frequency should only be done for test purposes. When “n” equals 0, the CH4390 broadcasts with the normal frequency hopping scheme. The CH4390 will discontinue broadcasting if any character is presented on TXD. 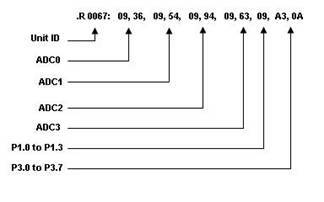 AT#PmUnR – Read Remote Sensor: This command causes the Network Coordinator to Read the values of all Digital I/O and Analog inputs from the remote node on PCN “m” with Unit ID “n.” The results are shown in Hexadecimal form as shown below. AT#PmUnSx – Set Remote Output: This command sets the values of the remote Digital outputs. The values will be reported as a single decimal number as described for the AT&Dn command. AT#R – Receive Broadcast – This command allows the CH4390 to receive a broadcasted message and to present that message on the /RXD line of the serial interface. The CH4390 is subject to damage if over-exposed to heat during solder reflow operations. Following the soldering instructions below will ensure that the process of soldering the module to the board does not damage the modem. 1-9 Ground Each of these pads provides a connection to ground on the CH4390. All ground pads should be connected. A solid ground is essential for optimum performance. 16 /RESET This active low signal permits the host system to force the CH4390 to execute a hardware Reset. 18 ADC4 This is one of five analog inputs to the CH4390. Each analog input connects to a 12-bit Analog-to-Digital converter, 4096 steps. Full scale input is 2.5 Volts. 19 ADC3 This is one of five analog inputs to the CH4390. Each analog input connects to a 12-bit Analog-to-Digital converter, 4096 steps. Full scale input is 2.5 Volts. 20 ADC2 This is one of five analog inputs to the CH4390. Each analog input connects to a 12-bit Analog-to-Digital converter, 4096 steps. Full scale input is 2.5 Volts. 21 ADC1 This is one of five analog inputs to the CH4390. Each analog input connects to a 12-bit Analog-to-Digital converter, 4096 steps. Full scale input is 2.5 Volts. 22 ADC0 This is one of five analog inputs to the CH4390. Each analog input connects to a 12-bit Analog-to-Digital converter, 4096 steps. Full scale input is 2.5 Volts. 23 /RTS This active low input signal presents Request To Send from the serial port to the CH4390 for flow control. The host system activates Request to Send when it has data to transmit. /RTS is a 5 volt tolerant input. 24 /RXD The CH4390 presents data and command responses to the host system on the /RXD, Received Data, output. 25 /TXD The host system presents commands to the CH4390 on the /TXD, Transmitted Data, input. /TXD is a 5 volt tolerant input. 26 / CTS The CH4390 uses this active low output signal to activate Clear To Send on the serial port for flow control. The CH4390 activates Clear to Send when it has data to pass on the Received Data line. 27 P1.3 This is one of twelve programmable digital input/output signals to the CH4390. It is set has an input or output using the AT&D command. The default setting for P1.3 is as an input. 28 P1.2 This is one of twelve programmable digital input/output signals to the CH4390. It is set has an input or output using the AT&D command. The default setting for P1.2 is as an input. 29 P1.1 This is one of twelve programmable digital input/output signals to the CH4390. It is set has an input or output using the AT&D command. The default setting for P1.1 is as an input. 30 P1.0 This is one of twelve programmable digital input/output signals to the CH4390. It is set has an input or output using the AT&D command. The default setting for P1.0 is as an input. 31 P3.7 This is one of twelve programmable digital input/output signals to the CH4390. It is set has an input or output using the AT&D command. The default setting for P3.7 is as an output. 32 P3.6 This is one of twelve programmable digital input/output signals to the CH4390. It is set has an input or output using the AT&D command. The default setting for P3.6 is as an output. 33 P3.5 This is one of twelve programmable digital input/output signals to the CH4390. It is set has an input or output using the AT&D command. The default setting for P3.5 is as an output. 34 P3.4 This is one of twelve programmable digital input/output signals to the CH4390. It is set has an input or output using the AT&D command. The default setting for P3.4 is as an output. 35 P3.3 This is one of twelve programmable digital input/output signals to the CH4390. It is set has an input or output using the AT&D command. The default setting for P3.3 is as an output. 36 P3.2 This is one of twelve programmable digital input/output signals to the CH4390. It is set has an input or output using the AT&D command. The default setting for P3.2 is as an output. 37 P3.1 This is one of twelve programmable digital input/output signals to the CH4390. It is set has an input or output using the AT&D command. The default setting for P3.1 is as an output. 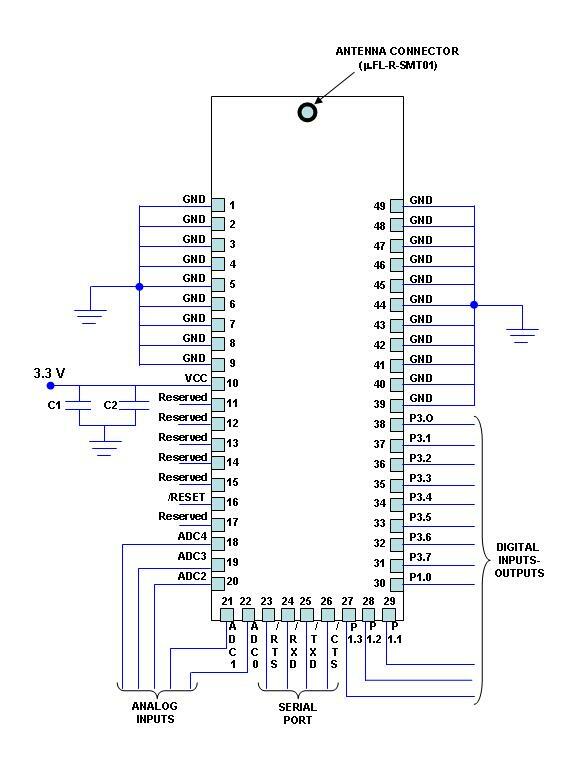 38 P3.0 This is one of twelve programmable digital input/output signals to the CH4390. It is set has an input or output using the AT&D command. The default setting for P3.0 is as an output. 39-49 Ground Each of these pads provides a connection to ground on the CH4390. All ground pads should be connected. A solid ground is essential for optimum performance. If VCC exceeds the maximum rating, the CH4390 transmitter will shut down. Cermetek offers two variations of the CH4390. The variants differ only in their operating temperature range. Table 5 below lists the available CH4390 models. 1) The designated Antenna xxxx must be used or the Modular certification of the CH4390 will be invalidated. 2) Capacitors C1 (0.01 µFd) and C2 (10 µFd) must be mounted as close to Pin 10 of the module as possible. 3) It is important that all ground pins be connected to a solid ground to prevent noise accumulation. The CH4390 has earned modular approval as described in FCC Part 15 rules. This certification means that no further transmitter certification is needed for systems using the CH4390. However, there are some restrictions on the use of a transmitter with modular approval. 1) Modular approval applies only to the transmitter. The final system may require verification of unintentional radiation. 2) When designing the CH4390 into a system, the designer must follow the application circuit in this data sheet and use a listed Antenna. Cermetek must approve for any changes or modifications to the application circuit. Failure to receive approval for modifications from Cermetek could void certification of the end product. 3) Any modification to the CH4390 after it leaves the factory is in violation of FCC Rules. 4) FCC rules require systems using the CH4390 to permanently affix an appropriate label on the outside of the finished equipment. The label must be clearly visible and include the information below. (2) This device must accept any received interference including interference that may cause undesired operation. The CH4390 is approved for mobile and base station applications. A minimum of 20 centimeters should be maintained between the antenna and the equipment operator. To ensure compliance, operation at distances closer than those defined is not recommended. The Warning message below must be included in the User’s Manual for the end product.